Mayor Sweetie Marbury said they did a “bang up job” spreading the word about Ballot 2(A) before this November’s election. Surprisingly to some, the ballot issue was defeated by a margin of 61% Oppose, 39% For. After the election, the Durango City Council decided to hold a number of meetings throughout the county to hear why locals didn’t like the ballot. The proposed ballot would increase city taxes over the next 25 years to help fund the Police and Public Safety Services, code enforcement, street maintenance, and complete street, alley, sidewalk, and ADA improvements throughout the area. 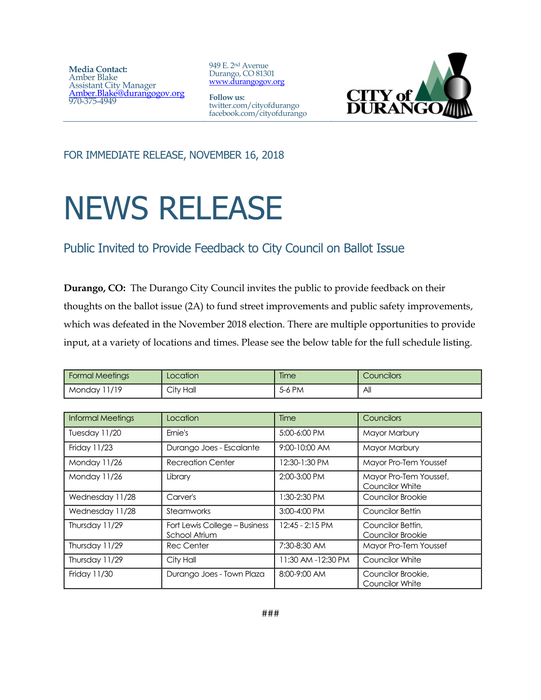 On a ballot fact sheet provided by the City of Durango, it is mentioned that the most cost-effective way to keep street in the best condition is continually maintain them before they get worse. The cost of maintaining a “good” road is around $2-7 per square yard compared to the $80 per square yard to re-pave. 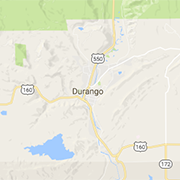 For reference, the City of Durango provided charts rating the current conditions of the roads in Durango. Here, it can be seen that many of the roads are good/very good, however many of them fall below this standard. Another piece of information provided by the City of Durango was about how part of the tax money would go to the design and construction of a new police station. The current police station was built over 70 years ago as a car dealership and used to only hold 30 employees. Now that the number of employees has doubled to 66, it has been proposed that a new police station be constructed to allow the station to grow with the needs of the town. These all sound like good ideas, right? But then why was the ballot rejected? A major concern with Ballot 2(A) was the increase on taxes and how it would affect Durango locals and business owners. The city of Durango gave an example showing that on a $400,000 dollar home, the residential income tax increase would be around $12.75/month. For commercial properties, there would be a $135/month tax increase on a million dollar property. And finally, the Durango the sales tax would increase from 7.9% to 8.45%. Others wrote in to local publications suggesting the ballot needed to be broken down into smaller chunks with a more transparent breakdown of proposed expenditures. Another local article mentioned that an organization called Citizen’s for Durango’s Future urged voters to reject the tax increase, arguing that the city has the money, they just aren’t using it properly. While the increase in taxes or the clarity of the proposed expenditures may have been concerning for some voters, the City of Durango wants to hear more. That’s why they’ve set up numerous opportunities for voters to express their concern with Ballot 2(A). The city plans to take what they learn from these meetings to better understand what Durango locals want so that they can propose a new ballot.